Today marks an exciting milestone for Workday: We have been named a leader in Gartner’s first-ever Gartner Magic Quadrant for Cloud Human Capital Management Suites for Midmarket and Large Enterprises. In fact, Workday was placed in the highest and furthest overall position in the leaders’ quadrant for our ability to execute and completeness of vision. (This graphic was published by Gartner, Inc. as part of a larger research document and should be evaluated in the context of the entire document. The Gartner document is available upon request from Workday. We are thrilled about this recognition, both for what it says about the value we create for our customers and how it validates what we’ve long known: Cloud HCM is the best choice for global businesses. When I joined Workday in 2009, the cloud HCM market was still in its infancy and on-premise technology was so entrenched that few people realized that massive changes were on the horizon. Workday was just four years old, and built on the vision of our co-founders Aneel Bhusri and Dave Duffield that the cloud was a far superior choice for customers over onsite finance and HR software licensing and maintenance. Now more than 1,100 organizations have selected Workday, and more than 70 percent of those customers are live and using the system across their workforces. Workday powers the global HR processes at companies like AstraZeneca, Hitachi, and Netflix. And because of the foresight that Aneel and Dave had, selection of cloud-based HCM over on-premise software is now the norm rather than the exception. 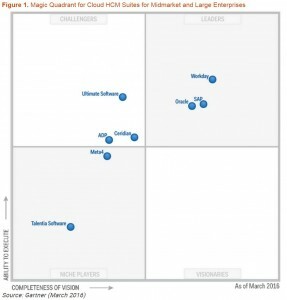 Gartner’s decision to develop a Magic Quadrant for cloud HCM suites is also an important milestone. That they separated cloud into its own category marks a huge shift in our industry and in how customers should be evaluating vendors. When Gartner knocked on our door as part of its evaluation process, we welcomed the opportunity to talk about what we’ve worked so hard to achieve. That includes offering not just HCM in the cloud, but building from scratch a modern enterprise cloud system that helps our customers gain visibility into their people and businesses, adapt more easily to change, and most importantly, to grow. Without question, customer satisfaction is at the core of what we’ve been able to achieve as a cloud provider. We’ve had greater than a 95 percent customer satisfaction rating every year since we began measuring it in 2007, and last year achieved a 98 percent rating. This level of customer satisfaction was virtually unheard of when Workday was founded—companies had gotten used to thinking that a poor enterprise software experience was simply the cost of doing business. The new normal we’ve strived to create is the exact opposite of that depressing mindset: High customer satisfaction should be table stakes. That’s why we encourage all organizations who are evaluating HCM vendors to spend a good amount of time talking to actual customers of each vendor about the deployment process and the product itself. We are thrilled about this recognition, both for what it says about the value we create for customers and how it validates what we’ve long known: Cloud HCM is the best choice for global businesses. Being born in the cloud has a number of advantages: Updates take hours instead of weeks or months, and having a single codeline lets us make those updates continuous so that our customers are never out-of-date or behind on the latest innovations or compliance rules. And because everyone is on the exact same version of our product, customers can more easily share best practices with each other. Yet we know there’s always more to do. Constant innovation and disruption is the new business imperative, and we’ve been listening closely to our customers to find ways to deliver an even better, smarter, and more intuitive system. For our customers, we will continue to invest in the underlying technology and rich features to meet your needs, and we will continue to demonstrate the integrity and core values that have fueled our shared success so far. There is so much more to come, and we are excited for the future we are helping to create. Gartner Magic Quadrant for Cloud HCM Suites for Midmarket and Large Enterprises, Ron Hanscome, Chris Pang, Jeff Freyermuth, Helen Poitevin, Melanie Lougee, and Sam Gritner, June 16, 2016. Check out our new eBook, which shares six effective and proven strategies to help employees develop their careers and to build a more engaged and motivated workforce. By 2025, half of enterprises worldwide will have invested in a cloud-deployed HCM suite for administrative HR and talent management, according to Gartner, and 20 percent will have created an HR innovation practice. Here’s a look at what’s driving those changes. How can we help people be more successful in their new roles, faster? One of the world’s leading experts in applied social network science, Rob Cross, and Workday’s Greg Pryor discuss the results of extensive research with more than 300 companies, and share insights about what creates individual success.